“RGB3D” (Ido Scherf and Shai Shtarker, Israel) was a clever installation. At first glance it looked like a pretty but meaningless display of coloured lightbulbs behind a fence. In front of the fence were three steps, coloured red, blue, and green. 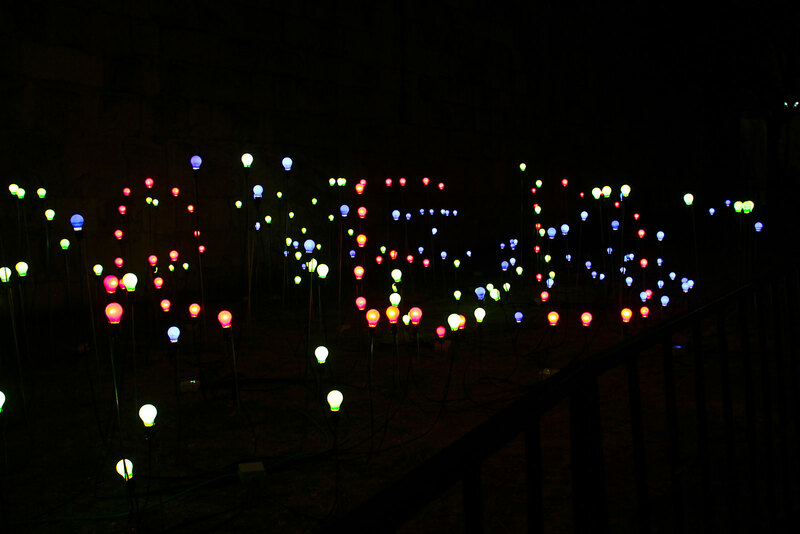 When viewed from the top of each step, the lights spelled the name of the colour. I took this photo from the RED step. “Moon Haze” (Feng Jiacheng and Huang Yuanbei, PR China), or the far side of the moon, literally. I walked around it to the other side to photograph the inflated moon at a reasonable distance, away from the crowds. I included the guy with the phonecam to show scale. 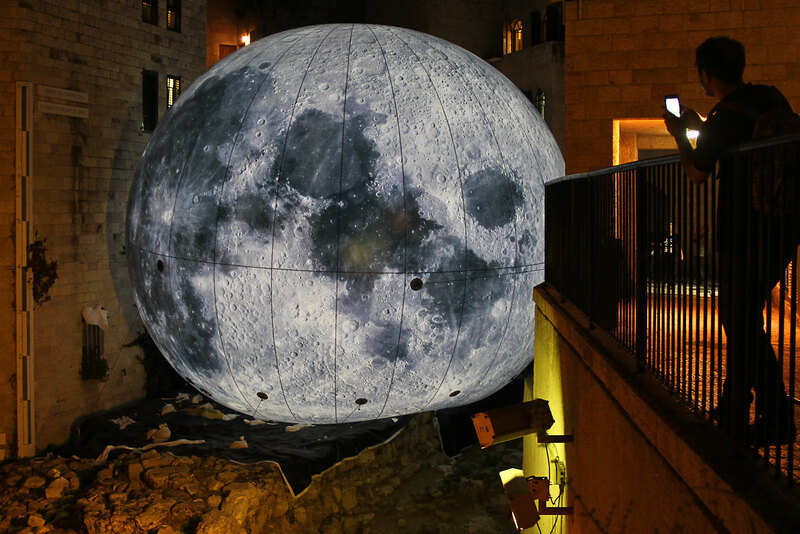 The moon is sitting on the 3,000-year-old Broad Wall, one of the ancient city walls of Jerusalem. 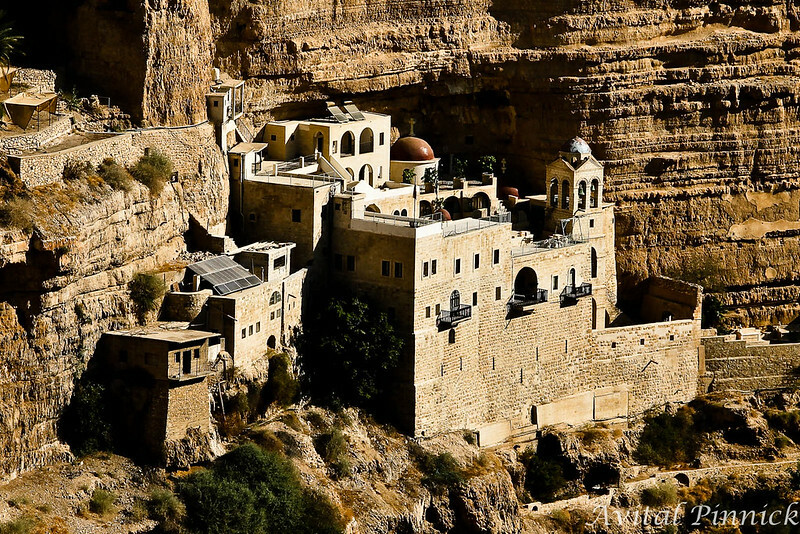 I’ve seen some weird things in the Muristan but “Oasis” (Gil Teichman, in collaboration with Nitzan Refaeli and Ronen Nadjar, Israel) tops them all. 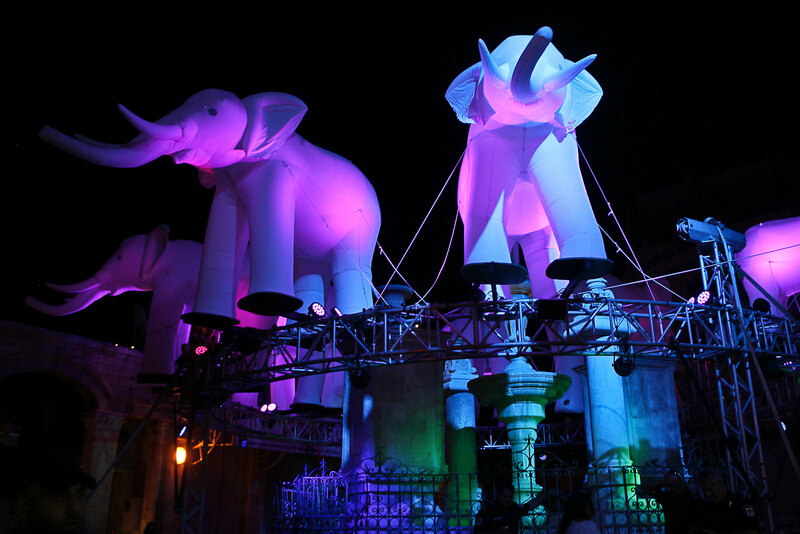 The installation “includes a special performance of favorite elephants from previous festivals.” Previous festivals? 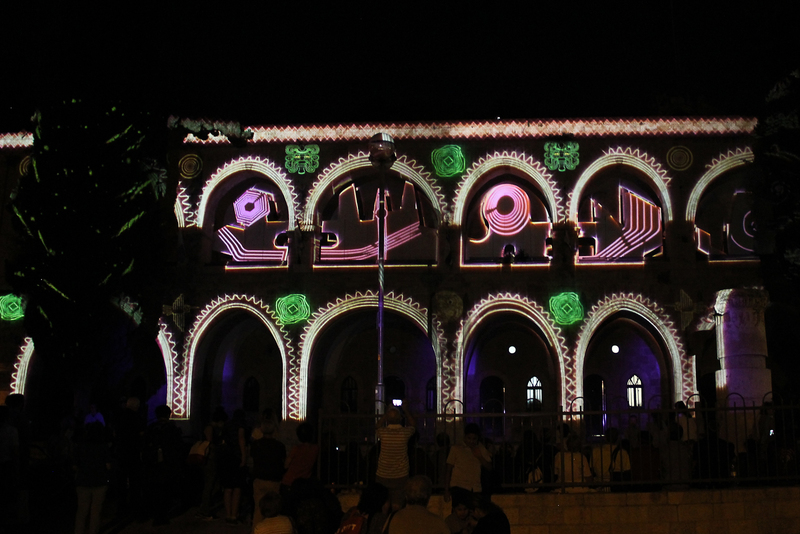 Does that mean previous Jerusalem Festivals of Light? Did anyone see the elephants performing? I saw inflated elephants with a soundtrack of elephants trumpeting. If someone managed to get elephants into the cramped streets of the Christian Quarter, that would have been quite a logistcal feat. 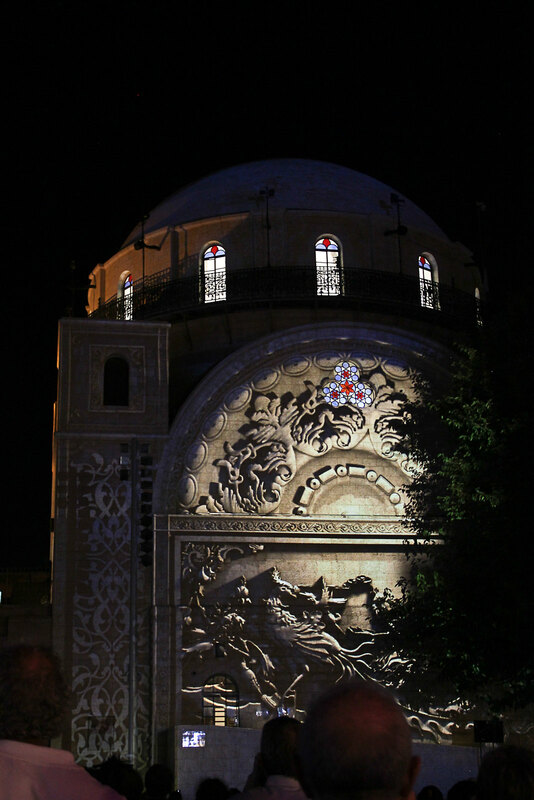 Batei Mahsei has had some stunning video-mapping installations projected onto its distinctive arched facade in the past. This was not one of them. 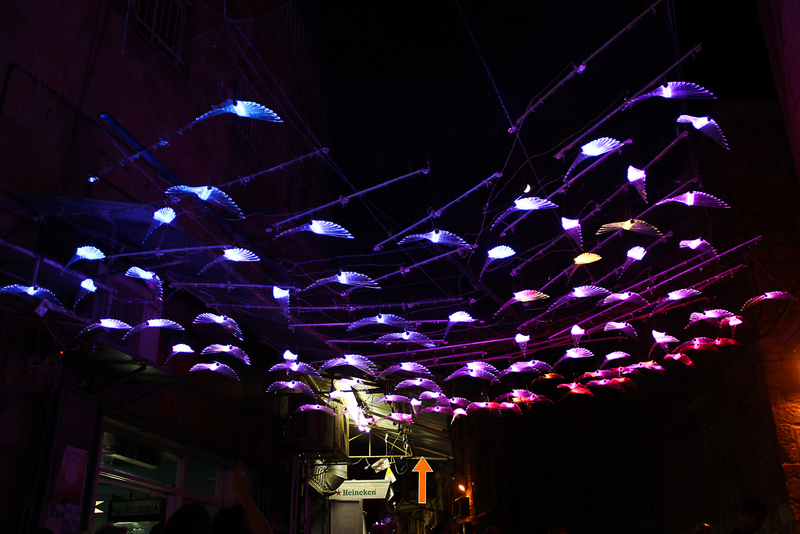 “Dream Machine,” by Liron Gavish, Shootzi, Tal Heuberger, and Ido Ramon, Israel. It was pleasant but not stunning. “Drawn in Light,” by Ralf Westerhof, The Netherlands, was simple but surprisingly effective. 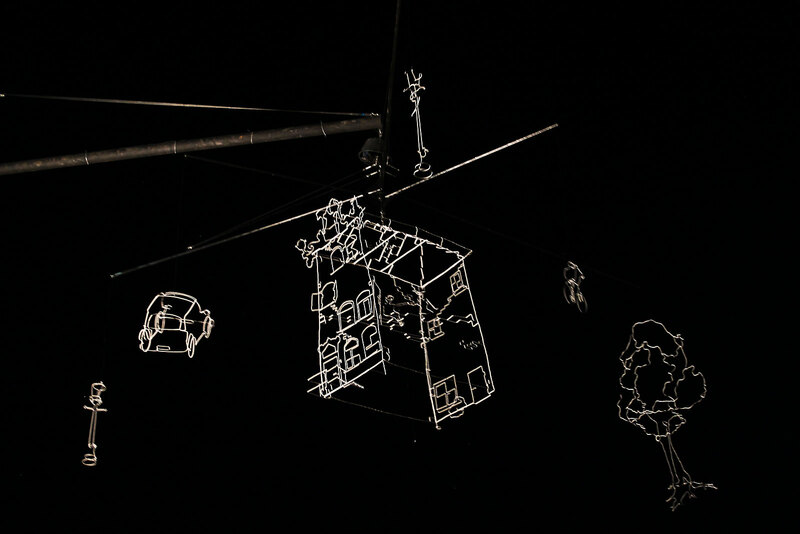 The three-dimensional wire house, trees, and other elements, suspended as a giant mobile, comprised a constantly changing landscape. The house’s rotation revealed new details and perspectives. It’s difficult to show scale in a photo. 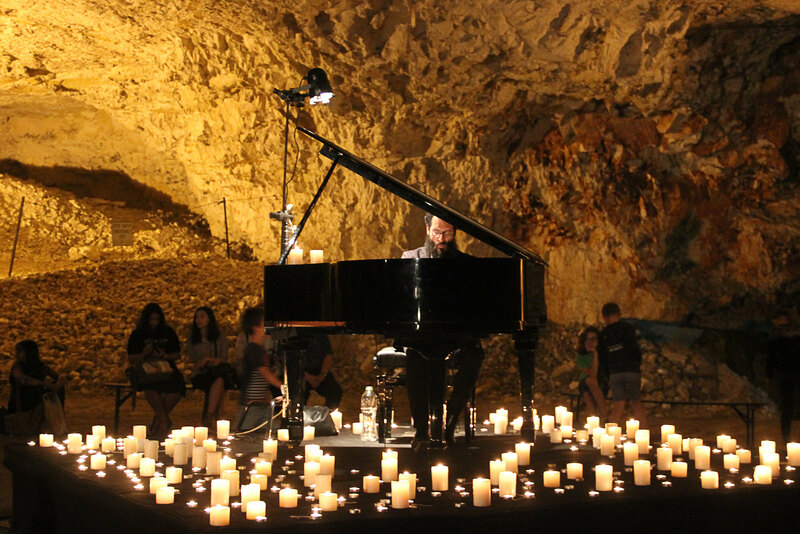 According to the description, the installation was 13 meters wide. 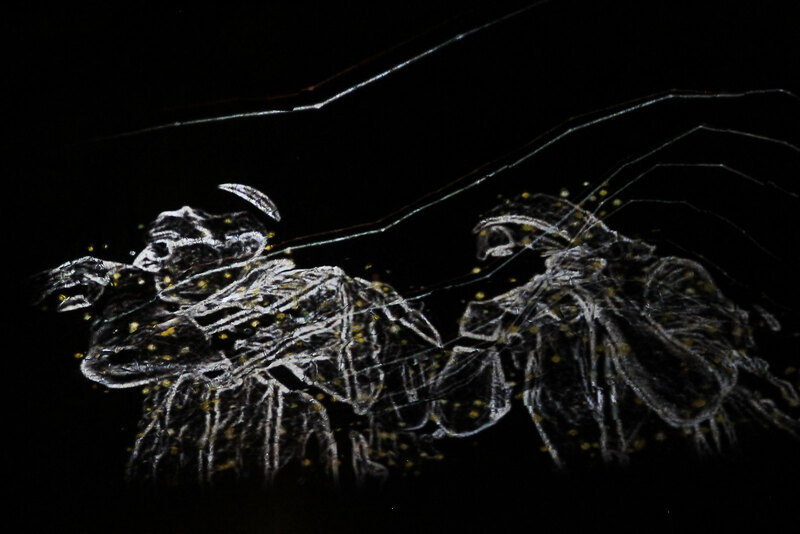 “Cathedral of Mirrors” (Mads Christensen, Denmark) was an interactive installation with motion sensors. 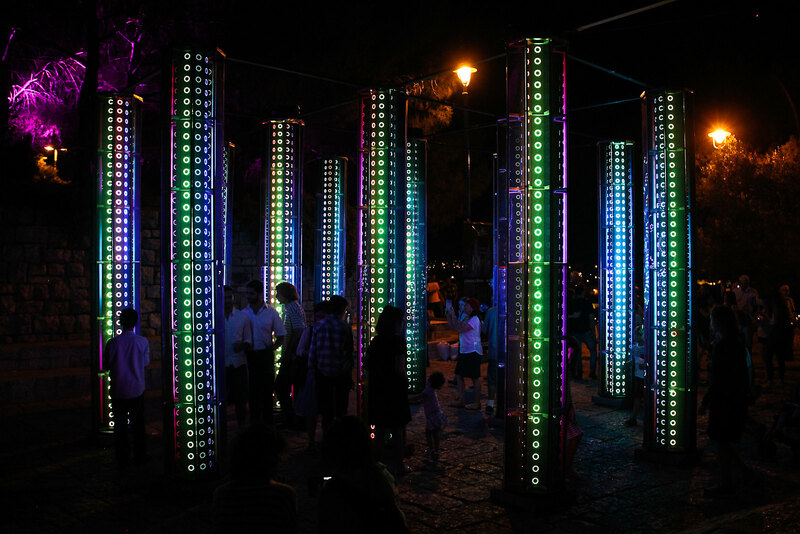 The colours shifted and pulsated when people walked between the columns or touched them. 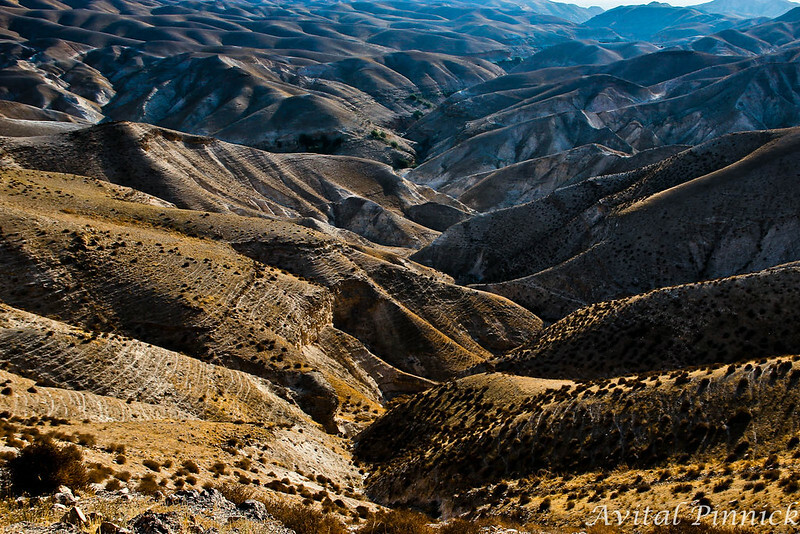 “Fly,” by Itzik Ilus, Israel. Clear plastic birds lit by coloured lights. This year the route was marked by orange arrow signs. They were much more difficult to locate and follow than the strings of LED lights usedat past festivals. Please bring back the light strings! 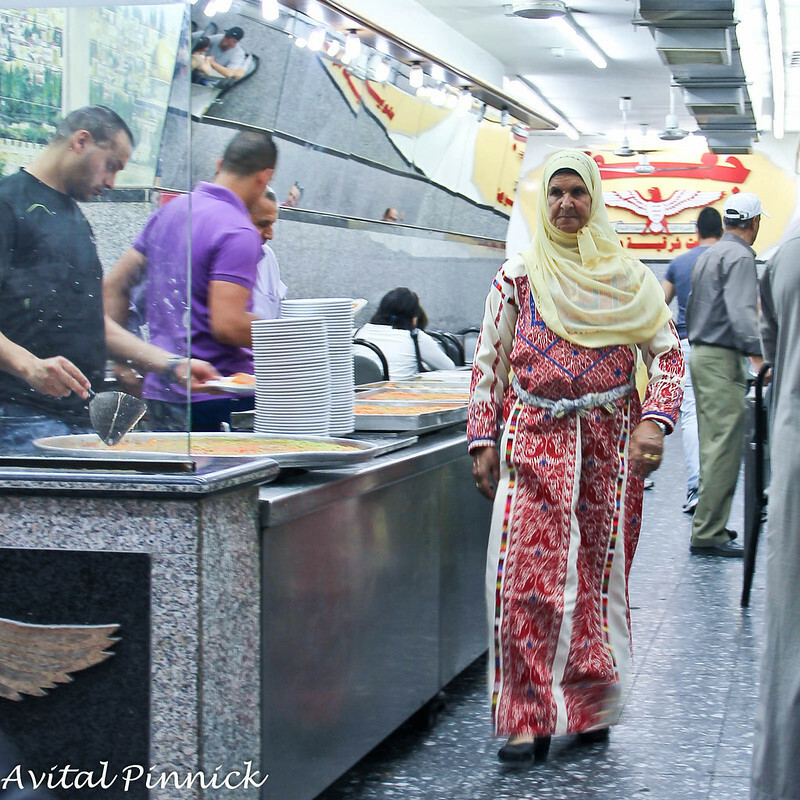 You have no idea how many people missed the sharp right turn down the stairs to Batei Mahsei, walking from the Cardo to the Hurva by accident. 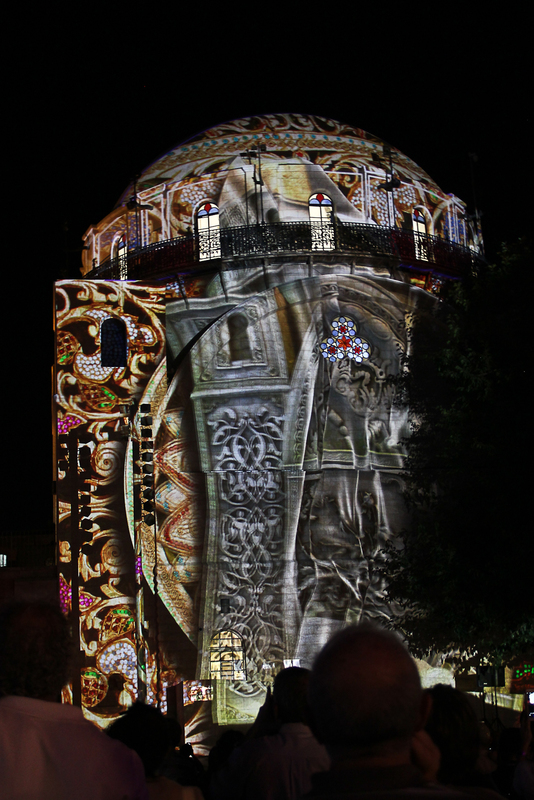 “Solaris” is a video-mapping installation by Visualsupport, Poland, incorporating the Hurva Synagogue. 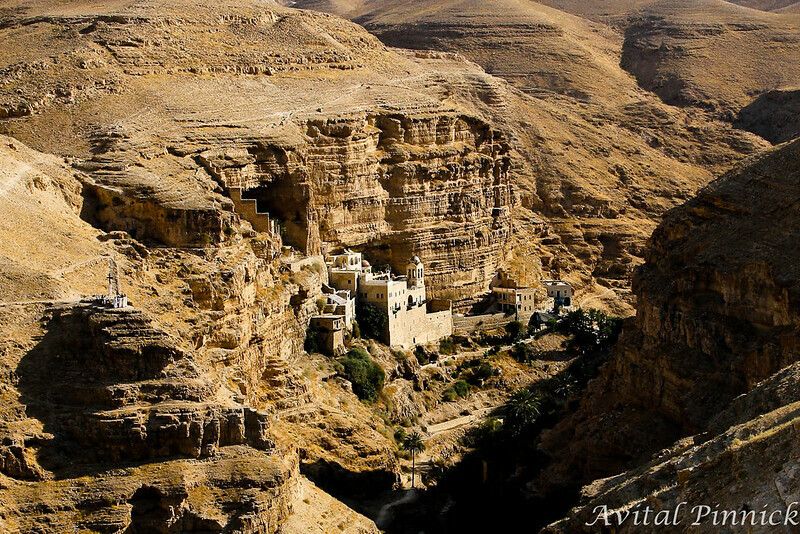 The festival brochure describes it as the show’s “world premiere in Jerusalem.” It was pretty, but not amazing. Scroll down for the video. 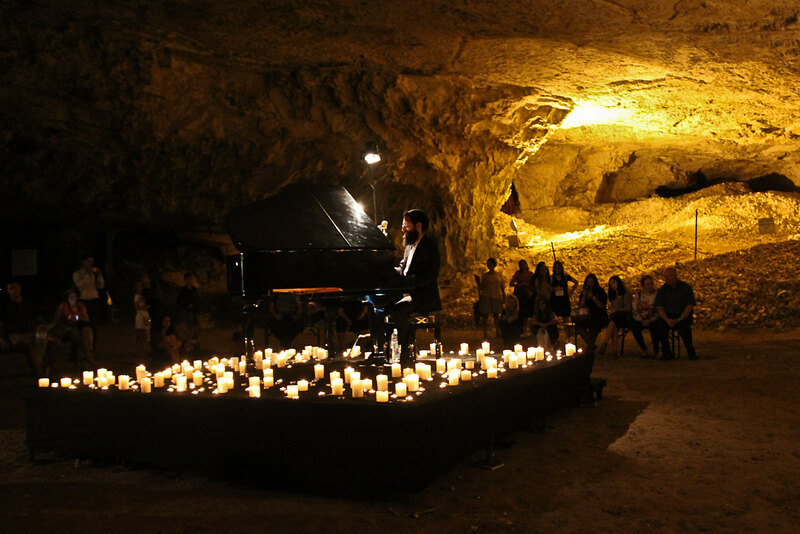 Where else could you see a piano concert at the bottom of a 2000-year-old cave? 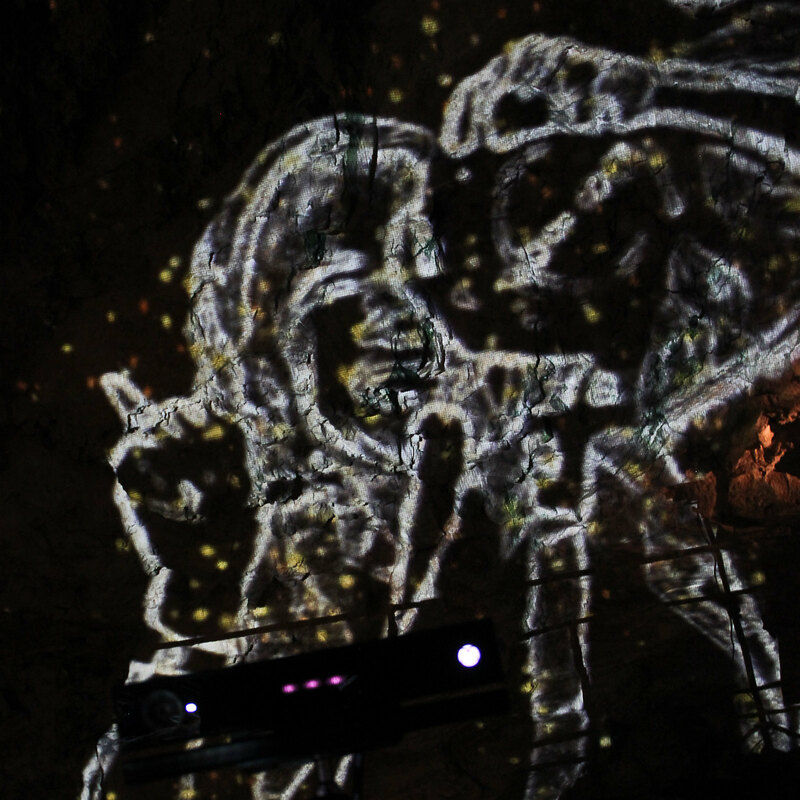 “Interactive Shadows” (Studio Insight, Guy Romem, Israel) refers to the cameras set along the path to the bottom of the cave. The cameras project images of the viewers on the walls, with different effects (line drawings, coloured silhouettes, etc.). 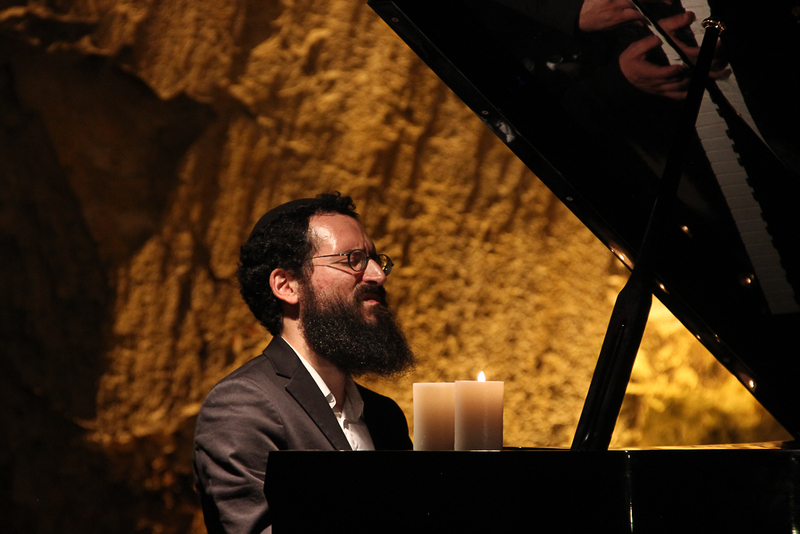 The musicians are listed as Yoel Shemesh and Achiya Asher Cohen Alloro. I have no idea who was playing that evening. At one point there was a loud cracking sound. The pianist, without missing a beat, looked over his shoulder at a bench that had collapsed in the middle from the weight of the children. 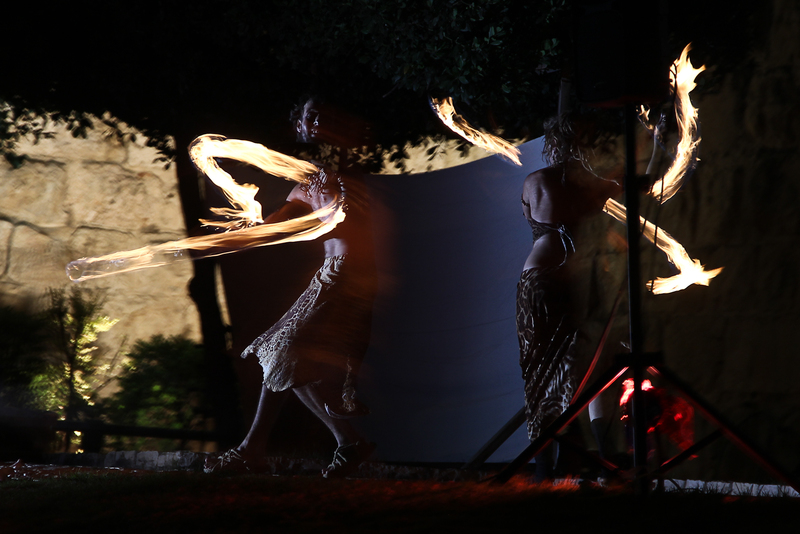 Fire and dance show called “The Tribe” (Lital Natanzon, Israel), in the open auditorium on Tsanchanim Road. I can’t say that I noticed any characters or encounters with figures from other worlds, but it was fun to watch. There are only two performances, at 8:30 and 9:15. I recommend you try to get there early, maybe first on your agenda, because it does get crowded. 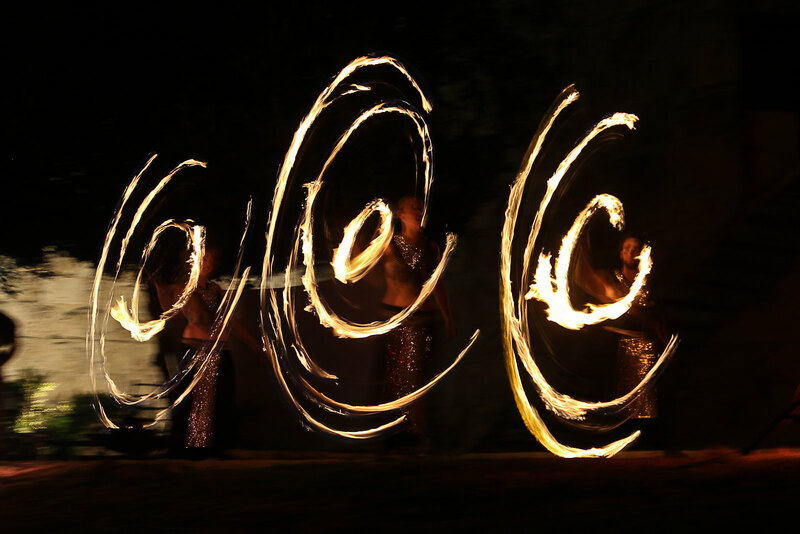 Long exposures are not easy when handheld at a significant distance. I call this one Headless Nick. Strange effect! This was a more traditional folk dance performance. Unfortunately, I don’t know the name of this group but they danced beautifully. 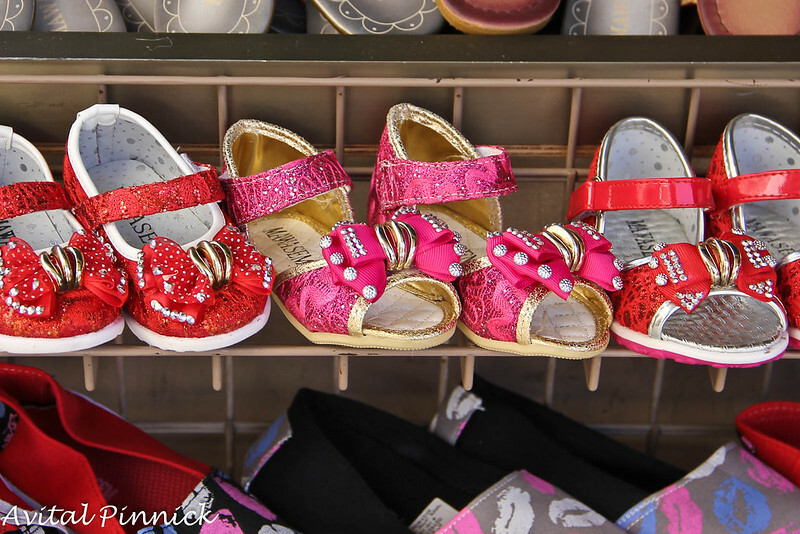 The girls are so light on their feet that they move like gazelles. 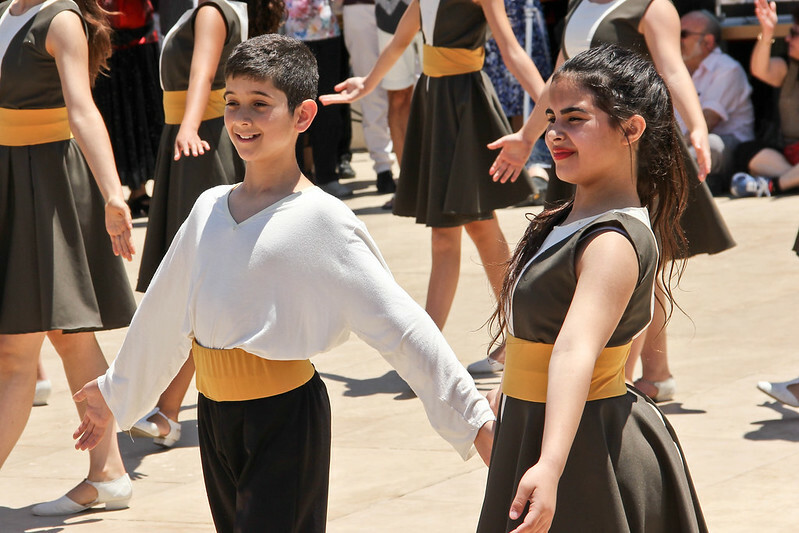 Very few boys seem to participate in the younger groups (I have a son–folk dance doesn’t have quite the same cachet for young boys as soccer and karate….). This group had two male dancers. 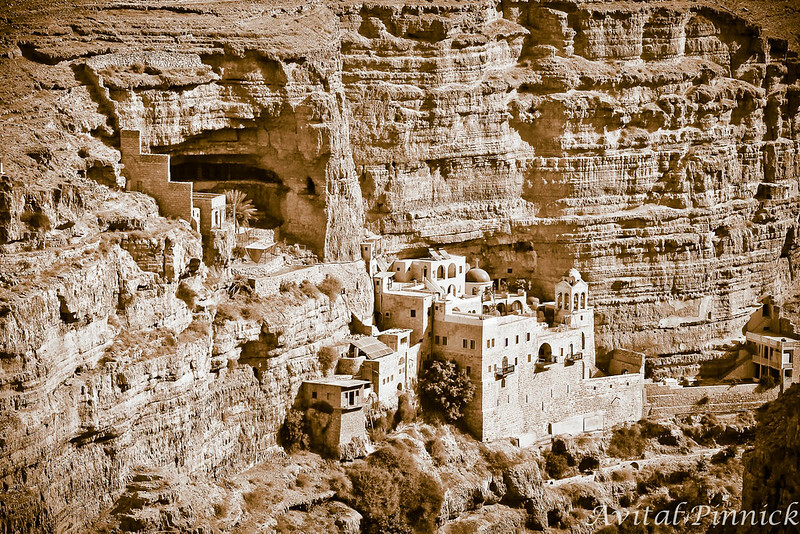 St. George’s Monastery, or the Monastery of St. George of Koziba, was founded in the 5th century and largely abandoned after the Persian invasion in the 7th century. The present complex was built in the 19th century. When we arrived, a small group was saying mass at the foot of an outdoor cross on the left side of the photo above (it’s hard to tell that they were Catholics in this photo, but with my 135mm lens I could see two priests and a deacon. 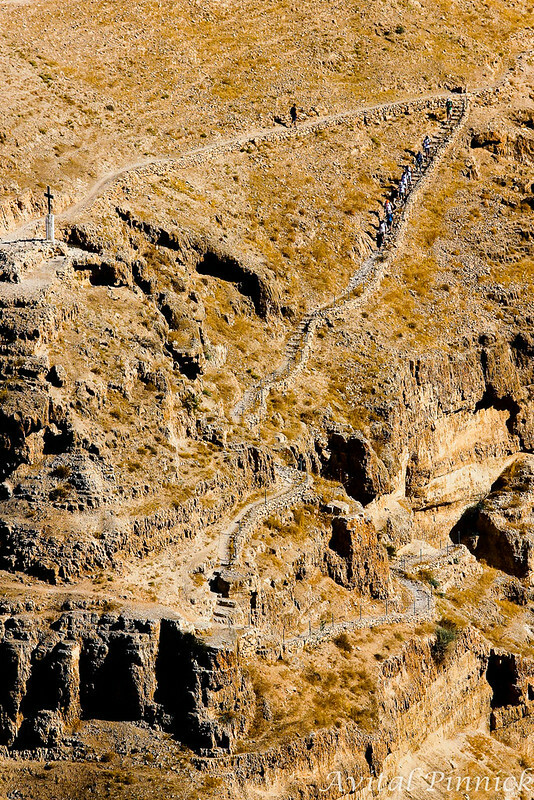 Steep staircase winds down to the bottom of the wadi. 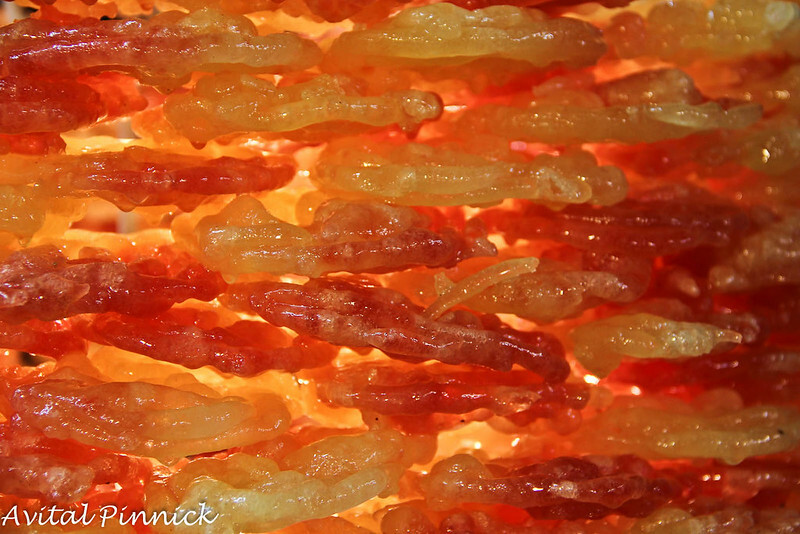 These photos are from a photography workshop that I attended near Mitzpeh Yericho. 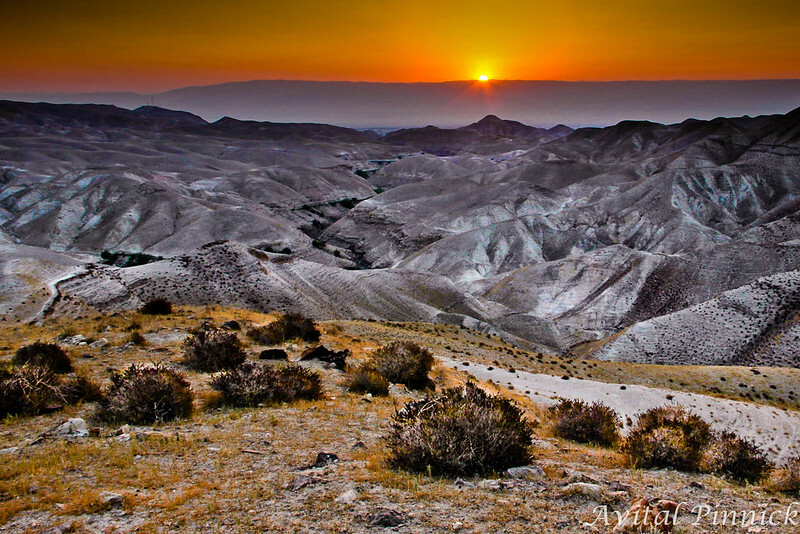 If you look carefully at the horizon of the first photo, to the right of the sun, you can see the Amman Gate Towers. Spider just hanging around. We all took turns trying to photograph it. The web was between a rock and a bush, with no place to set up a tripod. This shot was hand-held with a 90mm Tamron macro lens. 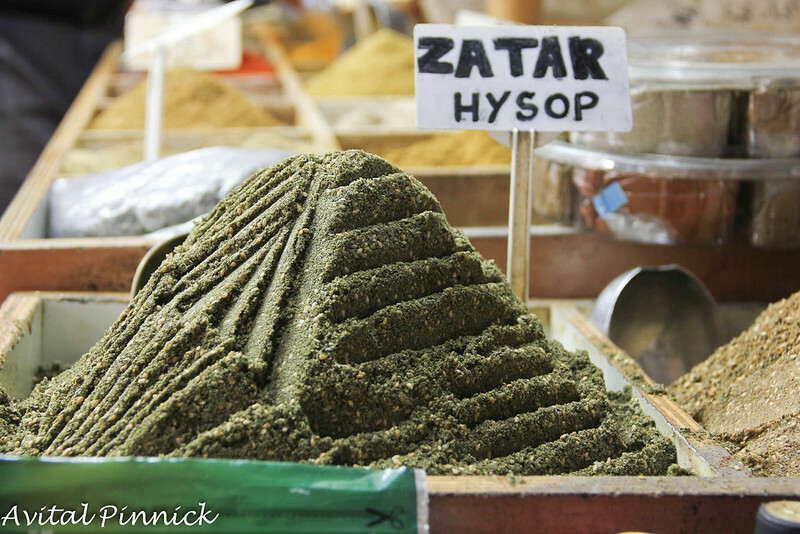 I don’t use it much and I didn’t think I could manage without a tripod, so this shot surprised me. 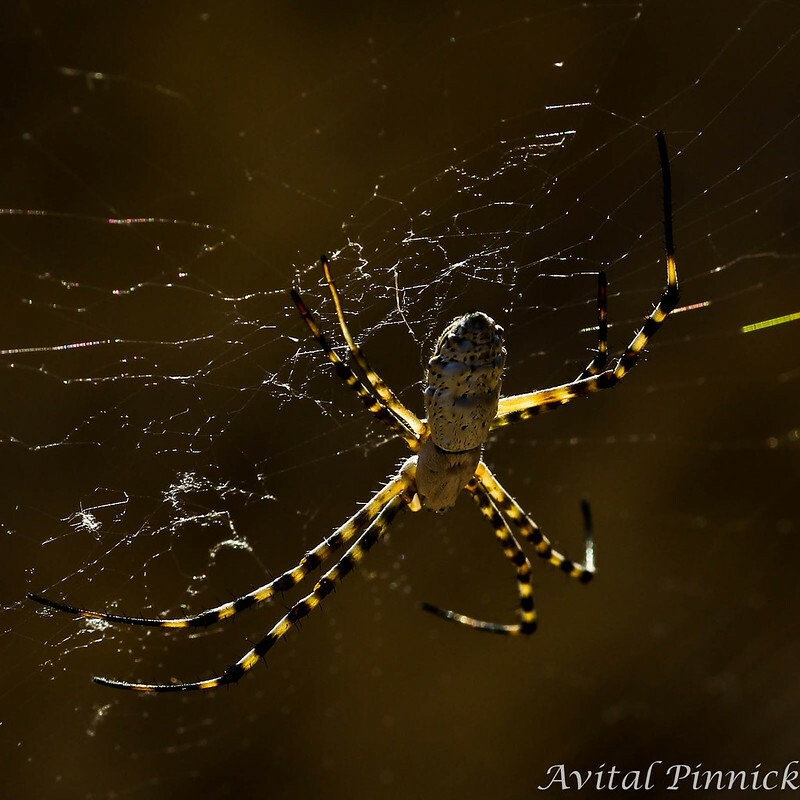 The spider’s legs are translucent! 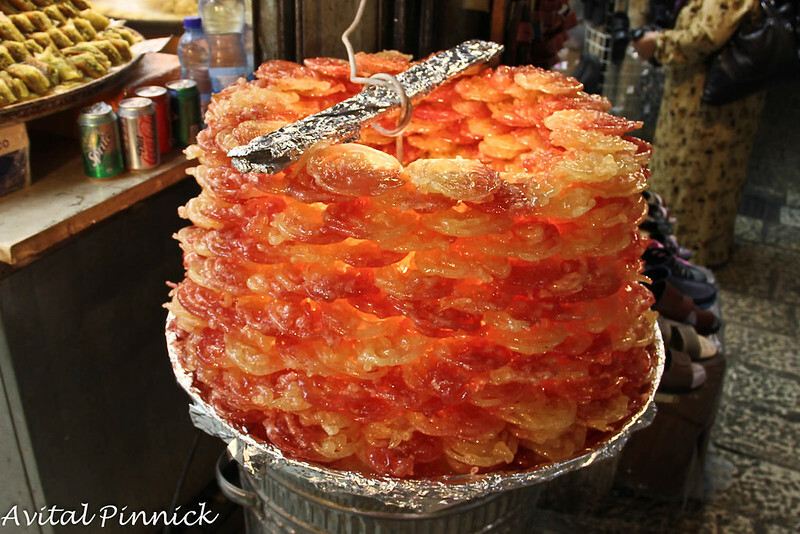 Close-up of sweets piled in a cylinder shape. Hand-painted sign at a butcher’s shop. 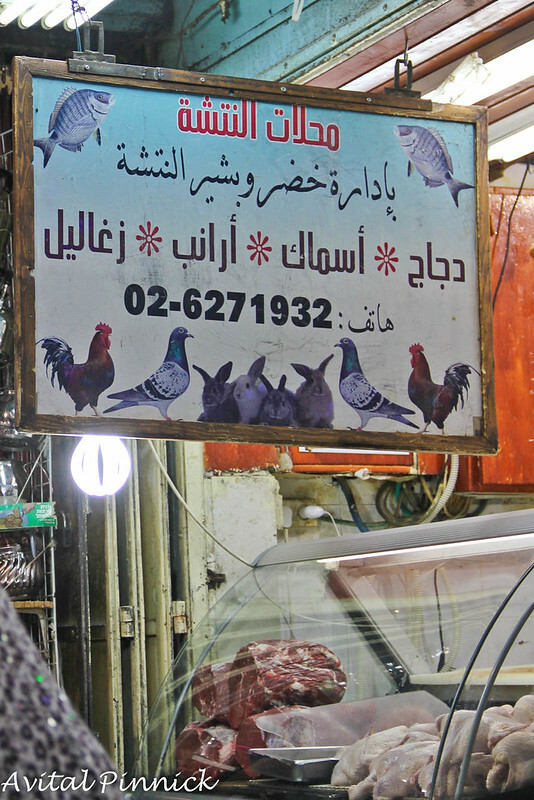 I should have asked the price of pigeons per kilo. 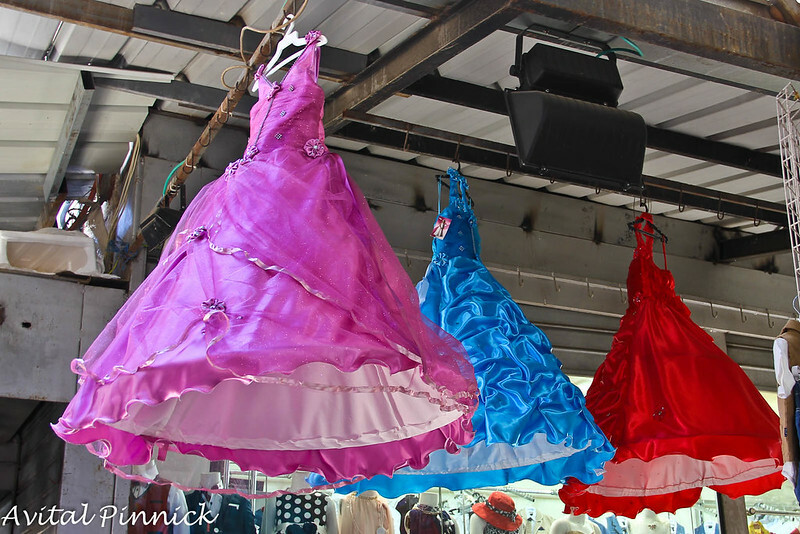 These dresses for little girls aren’t costumes. They’re for celebrations. Colourful padded bras are very popular. 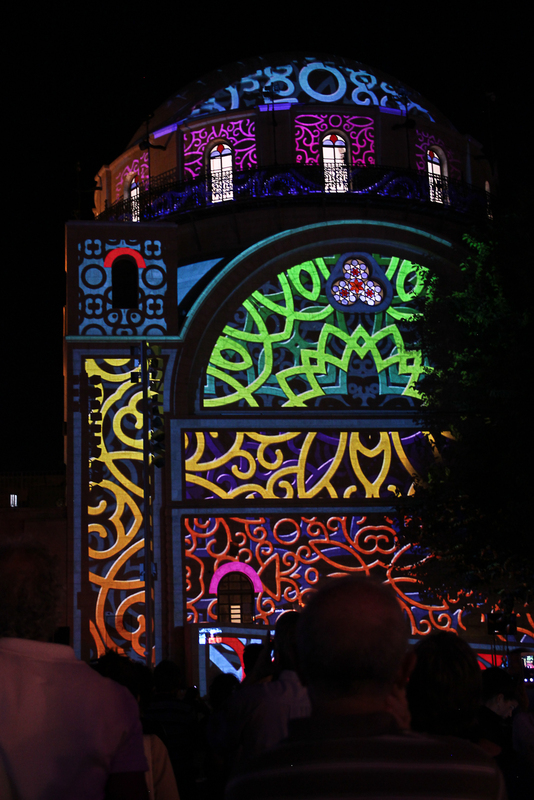 I was in the middle of posting the Jerusalem Light Festival photos when I got side-tracked by a weekend trip to Manchester and Dublin. 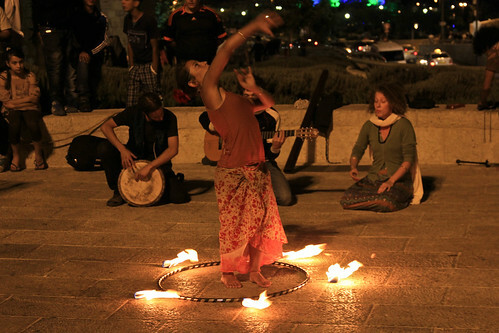 This woman dancing with a burning hoop was not part of the Light Festival but she was performing in Tsahal Square at the same time. I thought she was quite good and was glad I could get a video of the whole routine.